Roux-en-Y gastric bypass (RNYGB) surgery offers an effective and enduring treatment for morbid obesity. 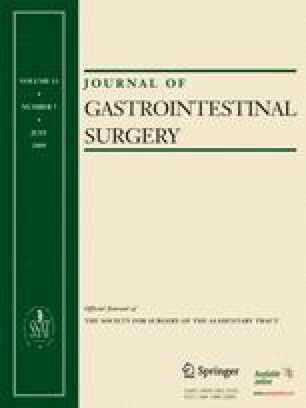 Gastric bypass may alter gastrointestinal (GI) flora possibly resulting in bacterial overgrowth and dysmotility. Our hypothesis was that daily use of probiotics would improve GI outcomes after RNYGB. Forty-four patients undergoing RNYGB were randomized to either a probiotic or control group; 2.4 billion colonies of Lactobacillus were administered daily postoperatively to the probiotic group. The outcomes of H2 levels indicative of bacterial overgrowth, GI-related quality of life (GIQoL), serologies, and weight loss were measured preoperatively and at 3 and 6 months postoperatively. Categorical variables were analyzed by χ 2 test and continuous variables were analyzed by t test with a p < 0.05 for significance. At 6 months, a statistically significant reduction in bacterial overgrowth was achieved in the probiotic group with a preoperative to postoperative change of sum H 2 part per million (probiotics = −32.13, controls = 0.80). Surprisingly, the probiotic group attained significantly greater percent excess weight loss than that of control group at 6 weeks (controls = 25.5%, probiotic = 29.9%) and 3 months (38.55%, 47.68%). This trend also continued but was not significant at 6 months (60.78%, 67.15%). The probiotic group had significantly higher postoperative vitamin B12 levels than the control group. Both probiotic and control groups significantly improved their GIQoL. In this novel study, probiotic administration improves bacterial overgrowth, vitamin B12 availability, and weight loss after RNYGB. These data may provide further evidence that altering the GI microbiota can influence weight loss.